Interesting facts about New Hampshire should give you something to think about and smile about. This list of New Hampshire facts is perfect for helping you to entertain your kids. These New Hampshire fun facts can be used as trivia questions to stump your family or entertainment to distract the kids during travel on your road trip with kids. Many facts about New Hampshire presented here are also fun educational opportunities for your children. Have a read of these interesting facts about New Hampshire when the kids have gone to bed and then introduce them as you travel through New Hampshire. OR maybe a better idea, get your kids to read these New Hampshire facts and debate which is their favorite or bizare New Hampshire fact. What is there to know about New Hampshire that you don't already know? On April 12, 1934, the second highest wind speed known to man was recorded on top of Mount Washington. It was an amazing 231 mph. In 1768, Governor John Wentworth built an estate in Wolfeboro, New Hampshire, which is now the oldest summer resort in the United States. New Hampshires Alan Shepard was the first American to be launched into space. He was born in Derry, New Hampshire in 1923. The Haverhill-Bath covered bridge is the oldest covered bridge still standing in the New Hampshire U.S. It was built in 1829. Peterborough, NH was home to the very first public library free to the public. It was opened in 1833. Levi Hutchins built the very first alarm clock in Londonderry in 1787. The Amoskeag Mills in Manchester houses the biggest United States flag ever created. It was made in 1914 and stretches ninety feet in length and fifty feet high. In 1908, Monsignor Pierre Hevey, Paster at St. Marys Church, established the very first credit union in the country. In 1938, Earl Tupper of Berlin, New Hampshire created Tupperware. There is just one area code for the entire state of New Hampshire: 603. New Castle, NH only covers .8 square mile. 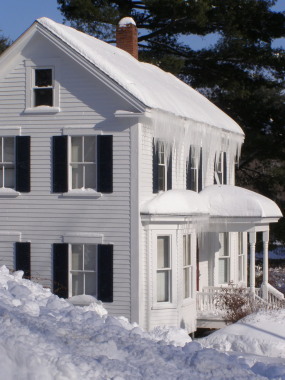 In 1890, the largest ice house known to the world was built in NH. The movie Jumanji was filmed in Keene and Swanzey, NH. Check these strange New Hampshire laws, we're hoping that these aren't still active? Some of the toughest laws have nothing to do with humans. In New Hampshire, cattle are forbidden from crossing state roads without a fitted device to collect their feces. New Hampshire visitors and residents must never maintain the national forest without a permit. This means there is to be no litter collecting, beach raking, or hauling away of trash without applying for a permit first. Do-gooders and nature lovers beware! When you check into a hotel, make sure to use nothing but your actual name. Doing so under an assumed name is considered illegal in this state. Seaweed belongs on the beach, so leave it there! Picking it up is considered illegal. When dining out or going for drinks, make sure to ignore the music. If you are caught tapping your feet or nodding your head to keep time you could be considered a criminal. If you get into trouble gambling, make sure to leave your clothing on your back. New Hampshire law forbids the selling of clothing off your back to pay for this type of debt. If youre in NH on a Sunday and wonder why it is so quiet, it may be because the operation of machinery is illegal on Sunday. Had enough of interesting facts about New Hampshire and looking forward to leaving no stone unturned while visiting New Hampshire. We're almost done...our last interesting facts about New Hampshire to check out. 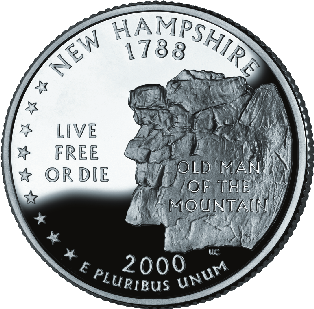 One president has been born in New Hampshire as of 2012: Franklin Pierce.